Bake a Swiss roll in your chosen flavour. Once it’s filled and rolled up – with the help of a piece of baking parchment – coat it with a layer of buttercream and place in the fridge until it’s ready to decorate. For the smile and pupils – mix together melted yellow and purple Colour Melts to make brown. For the spots and antennae – yellow. For the rest of the face – purple. For the spotty tail, spiny spikes and feet, melt yellow and purple Colour Melts in separate bowls. 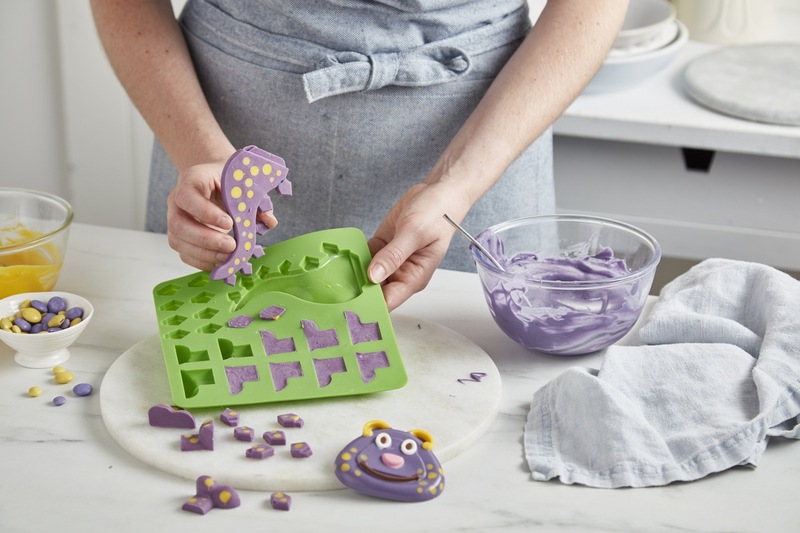 Carefully add dots of yellow Colour Melts to the bottom of the tail, feet and diamond-shaped spike moulds and fill with melted purple Colour Melts. For double-sided spots, add more dots of yellow on top of the purple – you won’t have to do this for the feet, but can for the spikes and tail. Place all your moulds in the fridge to set, then remove and gently pop out all your decorations. Step 5 – dine on dinosaurs! 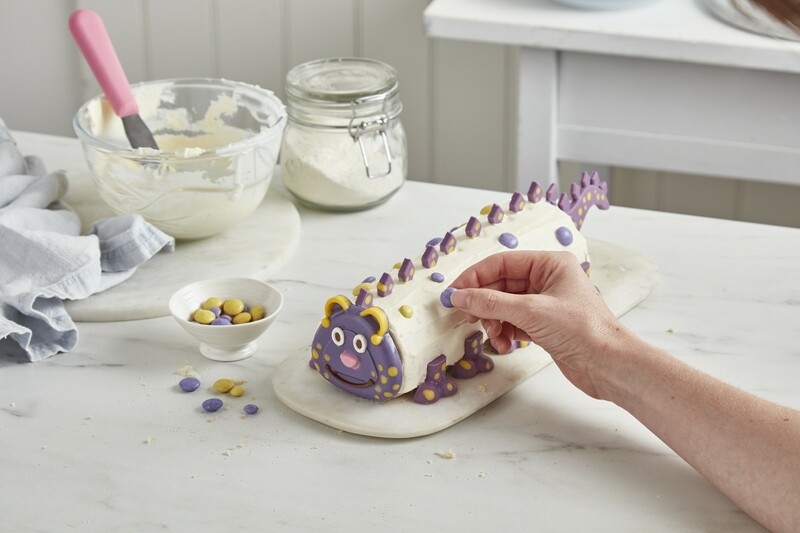 Place your Swiss roll-o-saur on a serving plate and carefully add the decorations – these should stick easily to the buttercream. Add five feet at even intervals on both sides; press the little back plates into the top; and finish off with the face and tail sections. 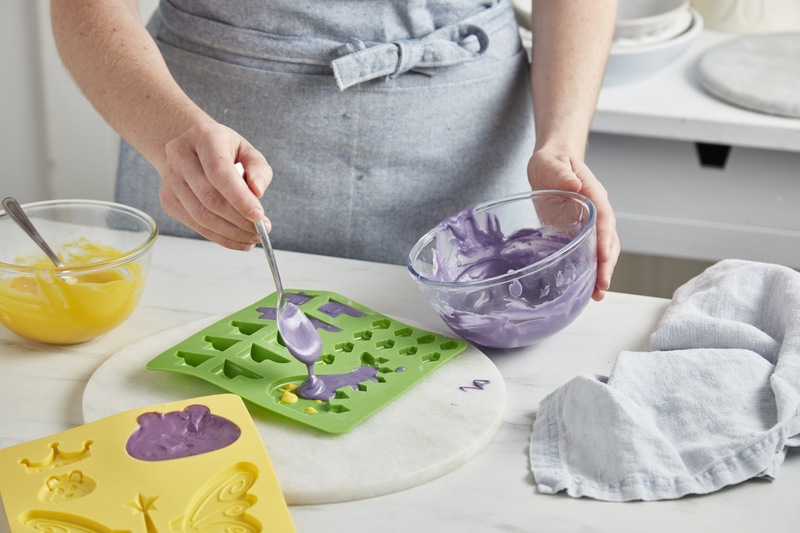 For a final fun touch, we added extra ‘spots’ using yellow and purple milk chocolate beans. Then all you have to do is serve… and bring yourself to demolish your cake creation! Reinventing the microwave mealWill you be affected by an invasion of house moths?